Here’s a great ‘explainer video’ with a link to the Deans for Impact report on ‘Practice with Purpose‘. The DFI has a wealth of information, links and resources to build into any school CPD offer. This particular report has been around for a while and is great resource to share as part of a CPD ‘Book/ Video Club’ or at the start of an INSET session. Combining visualisation, design and systems-thinking, this is my visual response to the question,’What does coherent, evidenced-based learning look, sound and feel like?’. David Jackson pointed me in the direction of this great talk from Professor Rosabeth Moss Kanter. In her TEDx Talk below on the ‘6 Keys of Leading Change’ there are loads of insights and gems that can be applied to a plethora of contexts. Show-Up: Being visible, being involved and being able to understand every perspective and viewpoint in an organisation or project; to understand, develop empathy, make informed decisions and ultimately, ‘making oneself available’ and knowing that sometimes, just your presence and ‘being there’ makes a difference. Speak-Up: The ‘Power of Voice’ is about shaping the agenda and being ‘thought leaders’. The example she gives of actively grading and giving students feedback on their participation in lessons both requires and supports each one of them to find and share their own voice. In this Key, she gives a clear definition of what ‘participation’ really means, where listening is absolutely integral to expressing your ‘voice’. She then illustrates the power this has by using the example of how a journalist’s ideas and his ability to use his voice to make suggestions about how to take action has created a ‘learning neighbourhood’ in Sao Paola and transformed the community. Look-Up: To look up to a higher vision and clarify the principles that are needed to guide everybody. Leaders who do this are in a position to prevent what she refers to as ‘hollow leadership’. She gives a pragmatic, day-to-day application and description of what it means to live your ‘Vision and Values’ and what engaging in your ‘noble purpose’ really means. ‘Looking Up’ is all about deliberately designing and committing to giving everybody the space and time to discuss, clarify and revisit your shared purpose. Embedding the act of revisiting your vision and values as an organisational habit will, ‘lift the spirits like nothing else’. Only when this is in place can you be assured that your vision and values are genuinely lived in every part of your organisation. Team-Up: ‘…nearly anything worth doing is very difficult to do alone’ and the best projects are those which have a ‘sense of partnership from the beginning’. To intentionally grow and deepen connections through partners who share your vision and values and draw them into your ‘nobler cause’ is highlighted as fundamental to the next step of deliberately aligning your partnerships, to develop and behave as ‘one big team’, to deliver your vision and values. Never Give-Up (aka Kanter’s Law): Only by stopping will you fail. This Key is integral to delivering your ‘noble cause’. Being aware and genuinely ready to dig deep as individuals, as leaders, as whole-teams and as learning organisations is underpinned by the requirement to persist, be resilient and resolute all the way through the implementation dip(s) which she refers to as ‘the messy middle’. The time it takes to develop and design a project, shape and refine it, align partners around your vision, values and purpose is time well invested. Lift Others-Up: Sharing and giving back to others is fundamental to ensuring the Six Keys are part of a sustainable cycle of development, innovation and ensuring we can all be part of a system that makes a difference. The Keys offer a great way to structure a modular leadership/ leading change development programme. The ‘6 Keys’ similarly provide a simple and practical framework ready to be adopted when assessing leadership competencies, mindsets and effectiveness. This framework could then be used to shape coaching conversations and programmes. I’m really interested in any thoughts and considerations for how they could be used in other contexts. So here I am. It’s been a long time but thanks to the limits of the 140 characters available to me on Twitter, I have been forced to move across devices from phone to Mac. Thanks (or blame) goes to @tomhelme, @tiffanyshlain, @pekabelo, @dileed and indirectly @jca_1975 for the inspiration to try to pull together some thinking and for what is to follow. This video resonates with current curriculum design projects I am involved with in various schools at the moment. It acted as a catalyst for me and the conversation that followed. At one point in the conversation, I made a casual reference to how we’re in the first stages of designing a ’T-shaped curriculum’. I first came across the term ’T-shaped’ in reference to employee competencies and a number of articles and research around organisational development, HR, resource and talent management. Here’s just one example from a talent search company and logistics company, Inspired Search (T-shaped_SCM). I created a diagram to show what the ‘T-shape’ looks like in its very simplest form as a curriculum model. What strikes me as I see it in this visual form, is not so much the simplicity of the model, which is a great prompt for the start of more complex and intertwined conversations, but the almost accidental relationship this exposes between subject expertise and competency development. 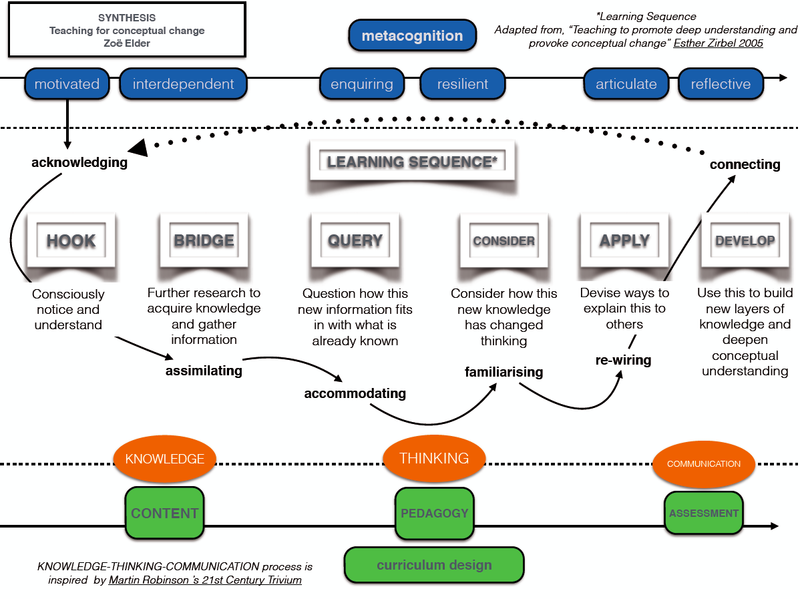 Even in a model like this which is deliberately intended to show a connected relationship between both the skills-acquisition and knowledge-expertise inherent in curriculum design, the separation seems too great. It’s one of those things where it works in my head but not on paper. I’ve even tried squashing the vertical to reduce the distance but it doesn’t really help. A very simple curriculum model. Subjects are represented by the vertical and generic skills, dispositions & competencies across the horizontal. But, as it stands, this model has been useful for us working through the ‘What?’ and ‘Why?’ of curriculum design subject-by-subject. It does a good job of depicting competency development and knowledge acquisition as clearly distinct from (but related to) each other. It also serves as an interpretation of curriculum where the development of skills, dispositions and competencies only happens in order to achieve the successful development of subject expertise, knowledge and understanding. On reflection, I’ve done a load of work on this type of discreet ‘in-order-to’ application of meta-cognitive skills over the years and, in the main, it works best when competency-development sits deeply within a specific domain or context. This context or domain is characterised by an agreed canon of knowledge coupled with a robust, evidence-informed system of subject-specific disciplinary literacies and frameworks for understanding. Put simply, the best kind of curriculum design is able to respond with enthusiasm and conviction to the questions, ’Who is our curriculum for?’ and ‘What should we teach?’ It should bellow its response with learning intentions such as, “Enquire like a historian”, “Reason like a mathematician” and “See the world as an artist”. In doing so, we can embrace a multi-disciplinary approach where generic competencies are developed in order to access domain-specific knowledge and understanding as part of the domain-specific expertise. 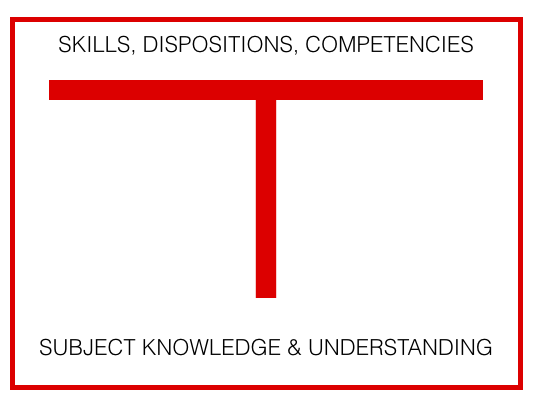 With the T-Shape, we have a model that develops transferrable generic skills as opposed to domain-specific competencies. But in a complex world, what we need is an I-shaped design. An I-shaped design allows us to embrace both the complexity of the multiple contexts in which we learn, and the inter-disciplinary realities of our ever-changing, complex world. So now we can invite our learners to: “See this portrait as a statistician”, “Respond to the world as an artist” and “Investigate this text as a musician”. This I-Shaped model enables us to see our curriculum through the lens of these deeper learning intentions. 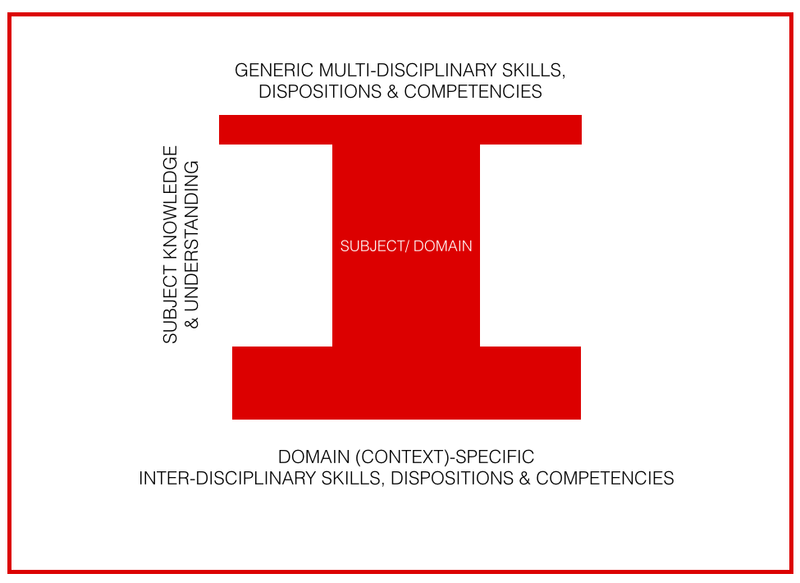 We can design learning that encompasses skills, dispositions and competencies, both generic (multi-disciplinary – across the top horizontal) and domain-specific (inter-disciplinary – across the bottom horizontal). Both can then be developed in order to access and so that we deepen knowledge and understanding of core concepts and canons. In my research for all of this work, I’ve come across some fantastic talks, articles and books. With that in mind, and as a pre-cursor to future posts, here’s a delightful rabbit hole I fell down when I came across the work of Tony O’Driscoll. His blog is here, where you’ll find a wealth of great thinking about the future of learning. I’ve included his TEDx Talk at Duke University from 2011, not least because it provides another useful visual and a compelling answer to any and all the questions about the purpose of curriculum, education and learning. ‘Compentencies’ that really matter for the future? I’m still in mid-thought on all of this. I hope you’ll find my musings helpful in some way and that you can use them as a start point for your own discussions about curriculum. In keeping with my commitment to post-as-I-think as opposed to posting-when-I’m-finished-thinking, here’s what I’m working on at the moment, and still working on. I have created the diagram at the bottom of this post to aid discussions around the design of the curriculum in relation to models and narratives of learning. This poses questions for me as to how (if it is indeed possible) we might identify specific moments within a learning session when metacognitive skills have been or could be deliberately developed and, at this moment, consciously recognised by learners. I am particularly interested in how this self recognition occurs authentically and beyond surface-level awareness of teacher-defined expected metacognitive skills. So that a learner becomes consciously aware of their deepening understanding of fundamental concepts either as they happen or as part of a reflective dialogue, taking place within particular subject domains or contexts. I’m also intrigued by the emotional aspect involved in this process – how it feels to be faced with–>then grapple with and then–> finally–>grasp a difficult concept to the extent where it can–>then be applied to new contexts and/or connected with existing knowledge. Anyway, this is where my need to draw and visualise thinking kicks in. I have attempted to indicate a non-linear pathway with a fat dotted line. Imagine this is one single learning sequence, whereas in reality, it is likely that it will loop or spiral back to previous stages, depending on the level of security the learner has at any given stage. I am by no means suggesting that learning is linear but wanting instead to map the experiences of a learner as a system or process. The metacognitive skills are developed through the sequence (in blue) and the process of knowledge acquisition and transference through the three elements of curriculum-pedagogy-assessment which I’ve written about here) are depicted under the thin dotted line. How is this of any use…? Seeing learning as a narrative: I am using this visualisation as a way to describe learning experiences as narrative. Which is beginning to have some additional applications beyond the formal curriculum provision on offer in school settings. Curriculum & Lesson Design Tool: I am hoping that this will be particularly helpful as I continue working on the deliberate design of the curriculum (longer sequences of learning) and any series of lessons within a fixed-term project or even individual sequences within lessons. Project & Enrichment Learning Design Tool: It may also be of use when planning field trips, enrichment activities or end-of-term excursions, when seeking to ensure that as much ‘learning value’ as possible can be squeezed out of any organised visit to a museum, place of interest or gallery. Self-Reflection Tool: This visual description is also useful in sharing with learners to VISUALISE their own learning and identify moments to either reflect on or expect it to be hard and difficult, and see any moments of struggle and challenge as an integral and necessary element of the process of learning. By using the diagram as a self-reflection tool, learners can identify the moments when they encountered struggle, challenge and success and use this as a script to articulate their own learning processes, the strategies that they used and how this might inform their approach to learning in the future. I have been immersed in a number of very engaging and, unsurprisingly, ‘Full On’ projects for a few months now. As a result, my thinking has deepened, my focus has shifted and my butterfly brain (though not attention-span, I hope) is currently taking me into both new and renewed areas of work. The impact of this is that I haven’t posted for quite some time. I tend to blog only when I have a near-fully-formed mega-post. It turns out, that just isn’t happening right now, so I need my blog to serve me a little better (rather than make me feel guilty for not feeding it). I am involved in a number of interconnected projects at the moment and I think its time that my blog started working for ME, rather than me feeling like I was working for IT. The result? I’m going to take a ‘post-as-I-discover’ approach – much shorter posts, sometimes with a resource/ video or with a link to an article or piece of thinking. I’ll do my best to add context and through this, a rationale as to why this connects with my thinking and how it might influence/ inform me but the finished product may have to wait or maybe that’s where you the reader comes in? On reflection, my tendency has always been to post near-finished ideas, thought-pieces or practical approaches, ready for consumption. Right now, I need my blogging to work differently for me. In doing this, I intend to be far more open about my thought-processes and the ideas that catch my eye along with what they connect with that I already have in mind or that I am currently working on.This is far more authentic and reflective of how I work within my own school and with schools and organisations around the country. In my reading this morning, the Connected Learning Organisation caught my eye. I’ve embedded the infographic below which gives a nice summary of the work they are currently leading. It might be of interest, on a large-scale, to anybody involved in taking a sytems-led integrated approach to the design of learning models for 21st Century learners and society. 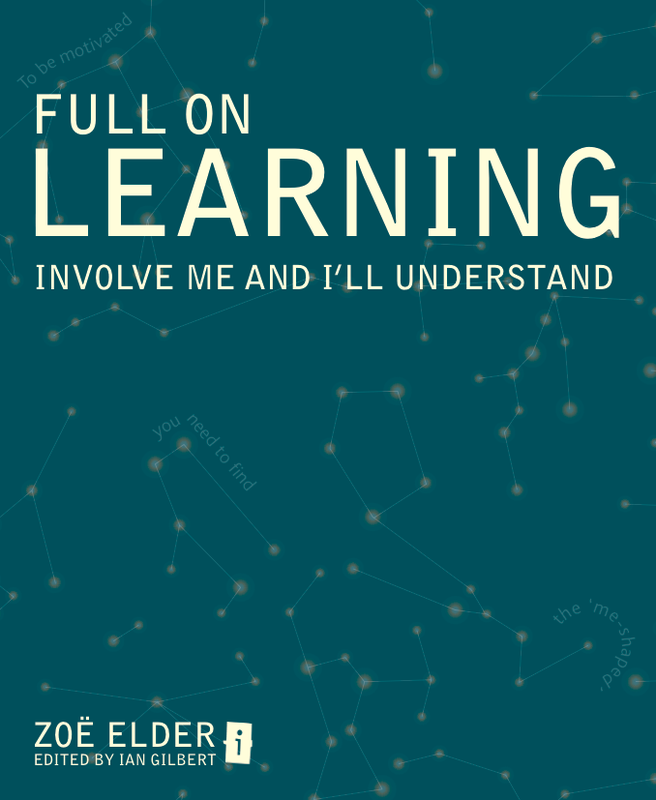 On a smaller-scale, anybody who;s keen to set up REAL learning projects would do well to consider the principles they use in the design of any multifaceted project-based learning opportunity. This Connected Learning Infographic is licensed under a Creative Commons Attribution 3.0 Unported License. You may Share and Adapt it, but you must give appropriate credit, provide a link to the license, and indicate if changes were made. This TED Talk by Professor Carol Dweck provides a good catch-all summary and introduction for anybody wanting to start doing some thinking around Growth Mindsets. I’ll be adding this to the Core Professional Curriculum iTunesU course we have at school. This talk is only 10 minutes, so we’ll be using it as an introduction to the start of an EduBook Club Meeting. It also works well as a stimulus for a departmental meeting with a team wanting to undertake some subject-specific action research or a staff meeting in a smaller setting where you want to start focusing in on the big hitters such as motivation and engagement. What do I know about the perceptions my pupils have of their own ability and how can I find out? How does this relate to me, in my subject area, for the groups I teach? How can I use the information from this research to refine my questioning to encourage pupils to refine, redraft and act on feedback? In what ways does this prompt me to consider the way I design learning activities? How does teacher-mindset influence verbal and written feedback? How can we develop a shared language of learning that explicitly promotes the belief that learning is a developmental process? 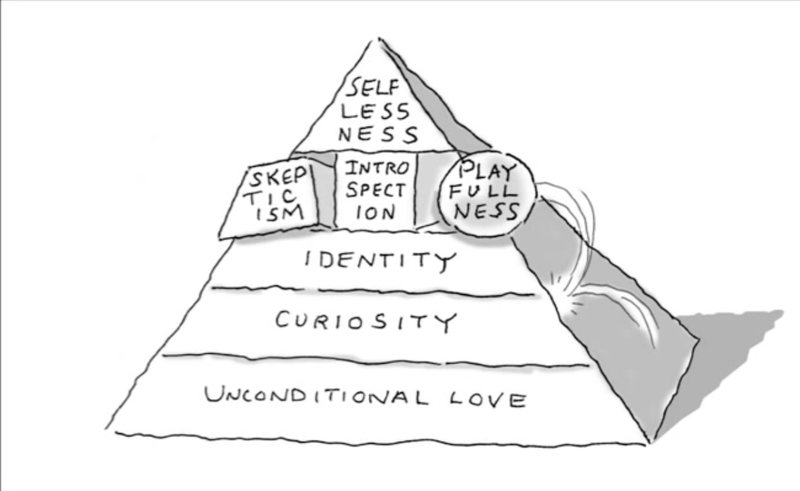 Dweck’s earlier book, Self Theories is well worth a read (be warned, it’s quite pricey!) as it gets right into the different ways that pupils perceive their own ability, respond to praise, feedback and criticism, based on years of research undertaken by Dweck and her team. Was I Better Today Than Yesterday?